VH-1’s Love and Hip Hop Hollywood reality stars Shun Love and daughter Amber Diamond take over Sideline Sports Bar and Grill in Tuscaloosa, AL to meet fans of the show. Playhouse Entertainment Music Artist Deedra B is a native of Tuscaloosa, Alabama and will perform on September 15 at Sideline Sports Bar and Grill. Photo by Shot by Sham. 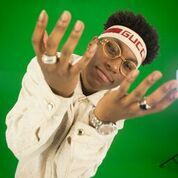 Playhouse Entertainment Hip Hop Artist J Gucci hails from Birmingham, Alabama and will perform on September 15 at Sideline Sports Bar and Grill. Photo by Shot by Sham. 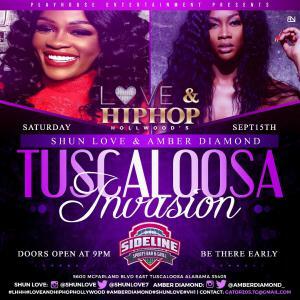 The Mother and Daughter Reality Stars Return to Their Alabama Roots to Meet Love and Hip Hop Hollywood Fans at Sideline Sports Bar and Grill at 9 p.m.
TUSCALOOSA, ALABAMA, UNITED STATES, September 14, 2018 /EINPresswire.com/ — Alabama natives entrepreneur Shun Love and music artist Amber Diamond are the newest members of the Love and Hip Hop Hollywood reality show. To celebrate joining the Season 5 cast of Love and Hip Hop franchise, the dynamic mother and daughter duo are hosting a meet and greet party in Tuscaloosa, Alabama under the banner, Playhouse Entertainment. On Saturday, September 15, Love and Diamond will invade the Sideline Sports Bar and Grill, 5600 McFarland Blvd. East, Tuscaloosa, AL 35405. Doors open for guests at 9 p.m. Preferred dress code is upscale attire. The celebrity event is open to the public and media friendly. For details, contact: Gator205.TC@gmail.com. "Bringing Love and Hip Hop Hollywood to Tuscaloosa is an amazing opportunity to let our fans know we appreciate them," said Love, a veteran club and concert promoter from the Dirty South. "The city knows how to party! Roll Tide!" The evening includes live entertainment by Playhouse Entertainment artists Amber Diamond performing her single, "Bad Energy," JGucci will perform, "Deposit," and Deedra B sings her current release, "How I Feel." "I am excited about bringing homegrown music artists to Tuscaloosa," said Love who is their manager. "Alabama has talent and I want the world to experience it." "Performing in Tuscaloosa is important to me because it’s near Birmingham, which is my hometown," said Diamond. 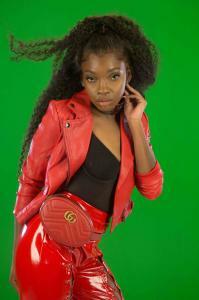 Songstress Deedra B who hails from Tuscaloosa says,"I'm actually very excited to perform in my hometown. I want my city to see how important it is to believe in yourself and manifest your own goals." Follow Deedra on Instagram @imdeedra. Birmingham, Alabama native J Gucci is also one of the featured performers. "Performing in Tuscaloosa, Alabama is a great way to share my talent and gain more exposure." Follow JGucci on Instagram @jgucci_4. “My daughter Amber Diamond and I left our hometown Birmingham to take on Hollywood. When we joined the Love and Hip Hop Brand, we wanted to go back to where we began and thank everyone who have supported us,” said Love. “We look forward to celebrating our win with fans.” Love and Hip Hop Hollywood airs Monday nights, at 8 p.m. ET/PT and 7 p.m. CT, on the VH1 network. Love and Diamond hosted an official viewing party for fans in Los Angeles on August 27 and another in Birmingham on September 3. The red carpet event was attended by celebrities and LHHH cast members. Love is more than a “mom manager,” the fierce and fabulous club and concert promoter from the Dirty South has worked with the likes of Future and Gucci Mane, but now she’s determined to build a family empire. A three-time teen mom, visionary and Hollywood mom manager, Shun wants to elevate daughter Amber Diamond into the superstardom spotlight. “My biggest concern giving Amber the privileged life I never had is I may be raising a spoiled and naive monster,” said Love who owns Playhouse Entertainment, an organization started in 2014 for the purpose of promoting major entertainment events such as concerts, arena shows and music festivals. Playhouse Entertainment was also a local club venue but has since expanded its influence to managing talent and securing music contracts for artists. Amber Diamond is no stranger to the public eye. 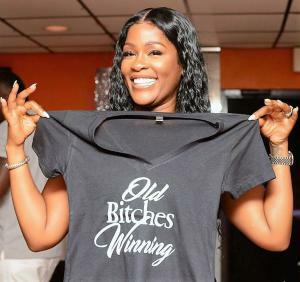 Last season on Love and Hip Hop Hollywood Diamond was introduced as Cisco’s “other woman,” but Shun says she didn’t raise her daughter like that. “We don’t do side chicks, we all or nothing,” which is why Shun is setting out to show how it’s really done. Diamond is also known for her appearances on various reality shows, including "Fix My Mom," with her mom. She was on "Binge Thinking" and "Wild 'N Out" on MTV. Diamond started modeling when she was 15. A couple of years later, Love and Diamond appeared together on TLC's "Raising Fame." For talent and media submission consideration, contact 323-717-3686 or send email to ShunLove.execassistant@gmail.com. To interview or book Shun Love and/or Amber Diamond, contact Marie Lemelle at 213-276-7827 or email requests at info@platinumstarpr.com. Next Next post: Are VIPs and Royals putting themselves at risk in Paris?